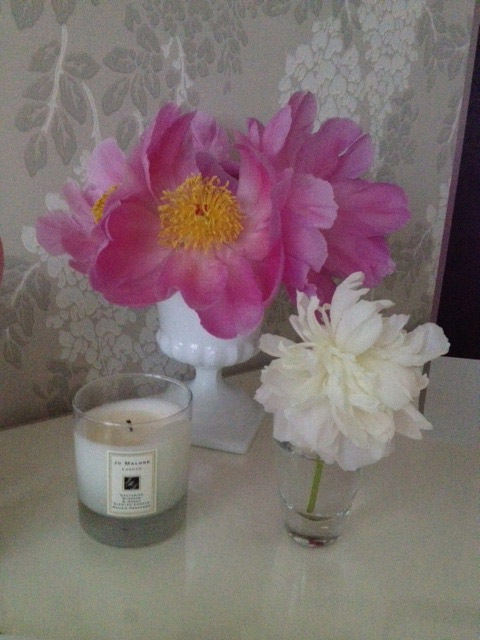 I am slightly obsessed with peonies. That's actually an understatement. Every year I anxiously wait for them to arrive in stores. I always seem to hit the jackpot with Whole Foods early May, thanks to the lovely state of North Carolina for keeping us well stocked. I even found some at Trader Joes this week, which is very exciting since they're half the price of Whole Foods. I have bought at least one, sometimes more, bouquets a week and display them all over the house. As you can see, it's the first thing I put in my shopping cart. Another trips loot in the car on the way home. Aren't they gorgeous!? These are currently on my cocktail table in the living room. By the kitchen sink. Love a single stem in a vintage bottle. Even in the guest bathroom. So happy the ones in my yard are about to bloom! Hopefully they will be ready to cut in the next few days. Anyone else obsessed with peonies?